The number of assaults against Muslims in the United States rose significantly between 2015 and 2016, easily surpassing the modern peak reached in 2001, the year of the September 11 terrorist attacks, according to a Pew Research Center analysis of new hate crimes statistics from the FBI. In 2016, there were 127 reported victims of aggravated or simple assault, compared with 91 the year before and 93 in 2001. But assaults are not the only form of hate crime carried out against Muslims and other religious groups. The most common is intimidation, which is defined as reasonable fear of bodily harm. Anti-Muslim intimidation also increased in 2016, with 144 reported victims, compared with 120 the previous year. 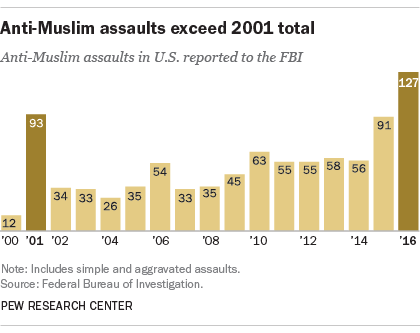 These numbers, however, are still dwarfed by the 296 victims of anti-Muslim intimidation in 2001. Certain types of crimes that damage or destroy property, including vandalism, also have risen, from 70 cases against Muslims in 2015 to 92 last year. Overall, there were 307 incidents of anti-Muslim hate crimes in 2016, marking a 19% increase from the previous year. This rise in hate crimes builds on an even sharper increase the year before, when the total number of anti-Muslim incidents rose 67%, from 154 in 2014 to 257 in 2015. As in previous years, the largest number of all types of hate crime incidents against religious groups targeted Jews. In 2016, there were 684 anti-Jewish hate crime incidents, marking a slight increase from 664 in 2015. By comparison, in 2016, there were 62 hate crimes against Catholics and 15 against Protestants. Amid the recent rise in incidents of hate crimes, most Muslims in the U.S. say their community faces discrimination. In a Pew Research Center survey conducted in early 2017, three-quarters of Muslim American adults (75%) say there is “a lot” of discrimination against Muslims in the U.S., a view shared by nearly seven-in-ten adults in the general public (69%). In addition, half of U.S. Muslim adults (50%) say that in recent years it has become more difficult to be a Muslim in the U.S., with 10% of this group attributing this to discrimination, racism and prejudice. In general, nearly a quarter of U.S. Muslim adults (23%) view discrimination, racism or prejudice as the most important problem facing American Muslims today. The FBI collects hate crime data from about 15,000 law enforcement agencies that voluntarily participate, which means the annual statistics likely undercount the number of hate crimes in a given year. Still, the report is a useful tool for comparing hate crimes over time and tracking the minimum number of these crimes that have occurred in a given year.